Even though you can use Flat Nose Pliers to crimp your crimp beads, until you begin to use Crimping Pliers, you won't really know how much more professional crimping pliers will make your finished art-piece. 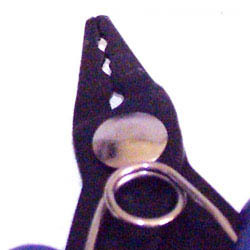 The Crimp Pliers will help curve your crimp beads so that the wearer of your jewelry piece will not feel any sharp & annoying edges; which lessens the value of your jewelry. If you have never used Crimping Pliers, it may take a bit of practice to get the hang of it but it will be worth every effort - to you and your customers/jewellery recipients. Firstly take a close look at the Crimping Pliers when the jaws are closed. You will notice 2 holes - one an oval hole with a dip on one side, & secondly an oval hole.